Rick Jackofsky has been presenting educational programs in public schools since 1993. Homegrown String Band™ programs are available to all Suffolk County school districts through the BOCES Arts-In-Education program, and meet NYS educational standards. Topics covered include oral traditions, improvisation, a brief history of the acoustic instruments used and their role in the development of American folk music. Homegrown String Band programs help to foster and encourage an appreciation of the unique multicultural aspects of American music. Presentations are available in classroom or auditorium formats and can be tailored to fit specific themes or periods of American history. The Homegrown String Band™ is available to present fiddle, banjo, and Appalachian flatfoot dance workshops at festivals or in tandem with an HGSB concert performance. We have facilitated workshops for the Appalachian Fiddle & Bluegrass Association (AFBA), the Long Island Traditional Music Association (LITMA), the New England Folk Festival Association (NEFFA), the Northern Music and Dance Festival (NOMAD), and others (ETC). Private banjo and guitar lessons with Rick for folks who are interested in exploring, and carrying on, the oral traditions of American folk music. 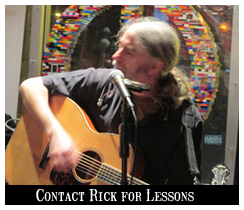 Lessons are available in person (Rocky Point, NY) or online via Skpe or Apple FaceTime. Read Rick's blog post about teaching traditional folk music "The Banjo Lesson: Thoughts on Teaching and Learning a Traditional Art Form"
Rick's new book, Ragged but Right: The Ungentle Art of Clawhammer Banjo, is now available from Bump Ditty Press!